On Saturday morning I arrived back from my first Bouchercon, held in New Orleans, a unique city full of life, music and amazing sights. 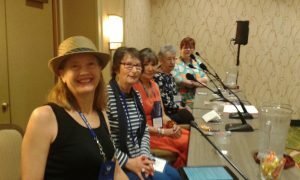 Bouchercon is a volunteer-run World Mystery Convention that drew around 1900 people, authors, mystery fans, book dealers and vendors from across North America. I was on the 22nd floor of a hotel with about 45 floors. By day, the view from my window was of the Mississippi. At night the city turned into a brightly lit fairyland. Most mornings I watched the sun rise over the river until it cast its broad strip of gold across the Mississippi. New Orleans has the second busiest port in the US and the railroad runs right by the river. One day, while waiting for a tour bus, I counted the number of attached cars on a freight train: 59. But what about the convention? I was in at the deep end hours after arrival, taking part in a panel discussing traditional mysteries with S A Solomon, Triss Stein, Connie di Marco and Christina Freeburn. All panels were named after song titles and ours was ON THE STREET WHERE YOU LIVE. With a lively audience who came up with lots of comments and questions, we talked about our characters and their worlds. Having the devious mind of a crime writer, Suzanne managed to make a verse of the song sound like the stream of consciousness of a stalker. For each time slot there were six panels with other events taking place in between so here’s just a snapshot of some of the events. 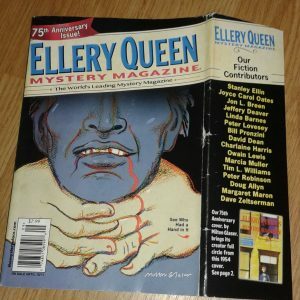 MURDER BY NUMBERS was fascinating account of the history of Ellery Queen, their works and the Ellery Queen Mystery Magazine which is celebrating its 75th anniversary. You probably know this already, but Ellery Queen was the pen name for the writing partnership of name of Brooklyn cousins Daniel Nathan, professionally known as Frederic Dannay, and Manfred B. Lee (Emanuel Benjamin Lepofsky). James Lincoln Warren, Janet Hutchings of EQMM, Shelly Dickson Carr, Ted Hertel, Brendan DuBois, Steve Steinbock and Otto Penzler had the statutory 50 minutes to give us spellbinding snapshots of the men, their writing and their magazine. On Saturday, the morning after he won the Macavity Award for The Golden Age of Murder, Martin Edwards moderated a panel that included Cathy Ace, G M Malliet, Charlaine Harris and Ragnar Jonasson on the topic Golden Years – an entertaining and appreciative look back at the writers of the Golden Age. There could be no other crime writing convention with this line in its programme: “Front of Marriot, Canal Street – Line up for Second Line Parade – On the way outside pick up an umbrella or bandana near the front entry“. And parade we did, the royalty of our clan drawn through the streets in decorated carts, escorted by police on motorbikes. (I’m told that the three responsibilities of the NOPD are homicides, burglary and parade.) We made our way to the Orpheum Theater to hear Lifetime Achievement Guest of Honor David Morrell interviewed by Lee Child. From tough beginnings, Canadian David Morrell got himself an education and by the time his American contemporaries were coming back from Vietnam, he was a young English professor. He got to know these veterans and they were in his mind when he created First Blood, an early exploration of post-traumatic stress disorder. The draft name for his hero was Blank until the day his wife invited him to eat an apple. He didn’t want to break off writing, but she persisted. He bit the apple and it was good. He asked her, ‘What’s it called?’ The apple was called Rambo. If you’re a crime fiction writer or fan, I recommend that you give Bouchercon a try. Next year it will be held in Toronto. 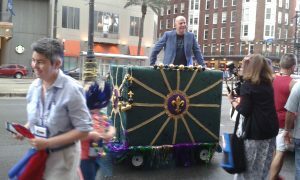 I stayed on for several days after the convention, and have begun a story set in New Orleans. I explored the French Quarter and went into the house – now a shop – said to be where Tennessee Williams imagined the Kowolskis living in A Streetcar Named Desire. The 1930s streetcars still travel along St Charles. 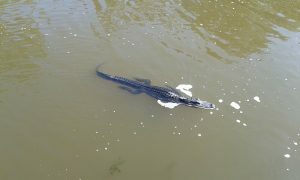 I caught one that took me to the Garden District, Aubudon Park and the Zoo. I walked around St Louis cemetery, visited a plantation, and had a magical evening aboard the Steamboat Natchez listening to jazz by the Dukes of Dixieland. 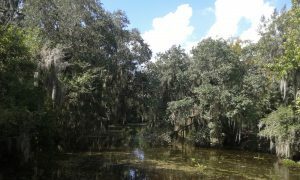 I took the swamp and bayou tour and watched alligators swimming. 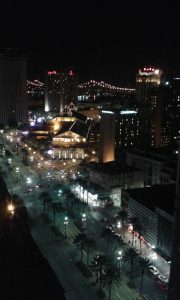 After the bustle of New Orleans that was like entering another world. Glad you had a great time. I too did the steamboat and cemetery but didn’t manage the plantation or swamp! Look forward to reading your New Orleans story. Yes, Martin, there was just too much to see and do! Congratulations on The Corpse Candle being included in Malice Domestic Mystery Most Historical – great title.